Pirates have never been much of a problem in this area– unless you count the privateers who plagued the Brits during our occasional wars and border controversies in the early years. 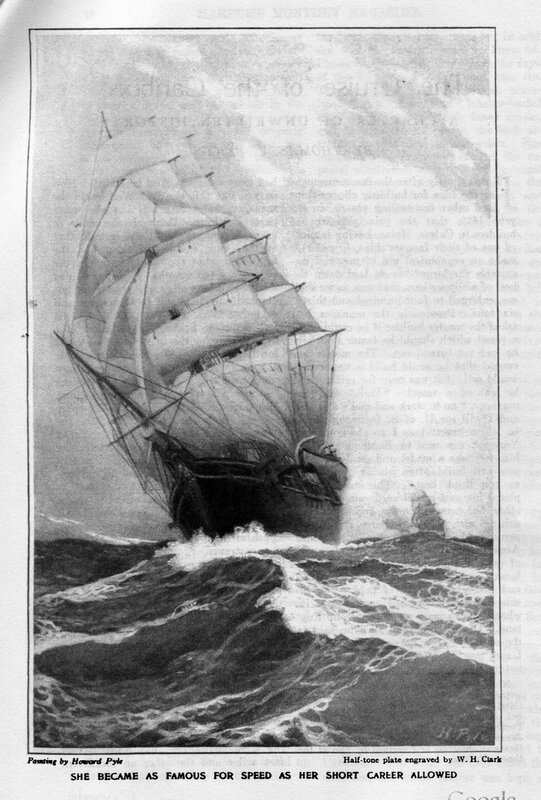 There’s also John Hogg Paine, one of history’s most violent and notorious pirates who, it is claimed by the Calais Advertiser in a 1901 article, settled in Union Mills near St Stephen after escaping the noose by jumping overboard a British ship off the Carolinas as the Brits were readying the scaffold. By way of pirates, and certainly much worse in the great scheme of things, were slavers– and Calais did have some connection with them, it seems. There was a 1906 article about the Calais slaver Arabian (Caribbee). 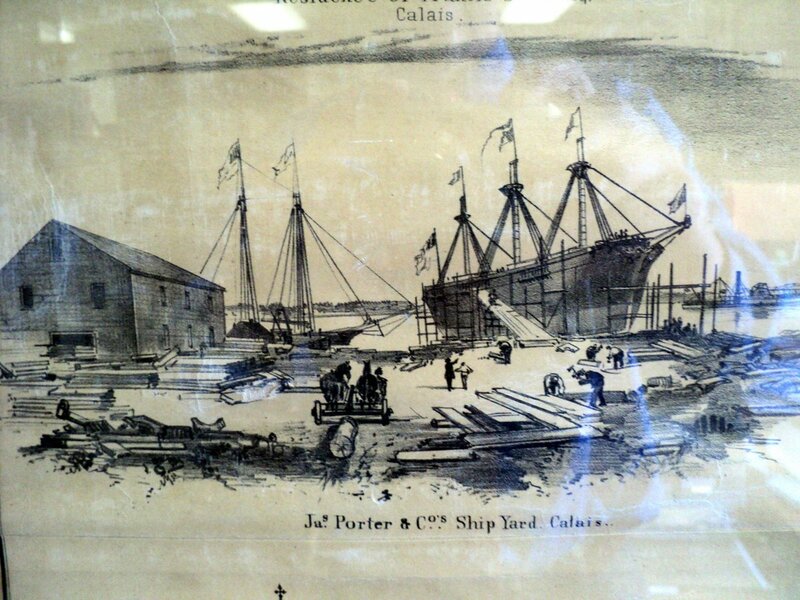 The article was written for Harper’s Magazine by Thomas Briggs, a Calais man who himself witnessed the building of the Caribbee, the fastest vessel of its day, at Calais, Maine, in 1852. Briggs also watched her sail out of the home port. Briggs was related to the Porters, for whom the vessel was built by James Hinds, and it is said every fact in this narrative was verified. The run to New York was made in four days, with head-winds all the way. She arrived at Sandy Hook on the third day of July, and on the fourth sailed up to the city, out sailing all the yachts in the bay. The pilot who took her in said she was the fastest vessel he knew of . As a matter of course, the bark attracted a vast deal of attention. The Spaniard bought the Arabian for $20000, a princely sum at the time and took the ship to Cardenas Cuba to be outfitted as a “slaver”. Under Captain Bazin, a Cuban, the Caribbee sailed for Guinea in West Africa, purchased a full cargo of slaves and upon recrossing the Atlantic was sighted by a fast British brig who gave chase. The nine-day chase was won by the Caribbee but the game was up as all ports had been notified of her status as a wanted slaver. 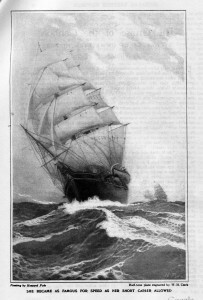 dollars.” Captain John Locket carried six of the crew to New York. So ended the single journey of the Calais slaver Arabian. 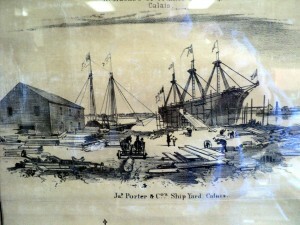 It was originally built by the Porter Shipyard in Calais (William Hinds was the Master Builder). To see the entire 1906 Harpers Magazine article by Thomas Briggs, click here.